Surf the Wave: simple approach to trade the waves without knowing or counting them. This trading approach removes the guess work usually seen with Elliott Wave analysis & patterns. The method transforms discretionary, insecure trading to a relatively simple and clear analysis with entries & exits (trading systems). 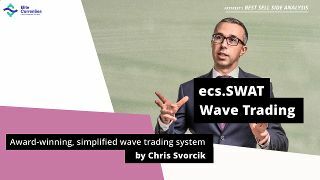 The ecs.SWAT method is an all-round package which offers education on technical & wave analysis, trading systems, and MT4 indicators & tools to traders, analysts, and investors. The SWAT education explains how traders can understand chart patterns, price swings, and waves in a simple way without overcomplicating their trading. The SWAT method helps traders to understand the price chart as a road map which offers trading opportunities. And finally, the SWAT systems, indicators, and tools help find and pinpoint higher probability entries and exits. All in all, the main focus of ecs.SWAT method is basically on patterns. The course explains how to identify, analyse, and trade price patterns in consistent and simple way. The method also includes extra webinars on understanding Fibonacci, trend lines chaos theory, fractals etc. The ecs.SWAT approach can be applied on all financial markets / instruments and on all time frames as well. The system is suitable for traders of all experience levels but will require more study and learning for beginners. The SWAT method is excellent for traders or aspiring traders that use price and wave patterns, wave analysis, Elliott Wave Theory for part of their analysis or trading. It is equally beneficial for traders who like chart patterns, patterns in general, and moving averages. The concepts can be used on any platform but the ECS indicators are only available for MT4 (Meta Trader 4). The method is taught by chart, technical and wave analyst expert Chris Svorcik, who has won the FXstreet award for best analysis in 2018 and has been analysing the financial markets for more than a decade.